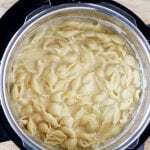 In the stainless steel insert of the Instant Pot, combine dried pasta, water, butter, mustard, salt and hot sauce. Lock Instant Pot lid in place and close vent. Use manual mode to set Instant Pot to High Pressure for 4 minutes. Instant Pot will take 10-15 minutes to come to pressure, then it will count down from 4 minutes. Once Instant Pot finishes 4 minute countdown, immediately turn pressure release valve to venting (Quick Release) and turn Instant Pot completely off. The keep warm mode should not be on to prevent overcooking the pasta. Once Instant Pot has released all the pressure, turn lid to open, keeping lid angled away from youth prevent steam burns. Stir in evaporated milk, followed by shredded cheese by the handful. Continue stirring until cheese in completely melted. Serve immediately, or switch warm setting back on to keep warm.